RV Garage : RV Storage Buildings : OptiKits! If you need to get your RV out of the weather, or stop paying rent somewhere, then an RV garage from us is an ideal solution. We can provide a turnkey installed building or one of our DIY barn kits to solve your storage problem. Post frame buildings provide inexpensive permanent storage solutions that are attractive and easy to build. They go up fast too! We can install your building in about a week. Pictured is a 30×40 20′ tall building with one 3068 entry door and a 14×16 insulated overhead door. The building features 3 ply 2×8 laminated posts 8′ on center with trusses at 4′ on center. Galvanized ring shank nails are used through out the framing and color matched powder coated wood binder screws fasten the metal siding and roofing. Stainless screws available. There are 22 colors available to decorate your building. 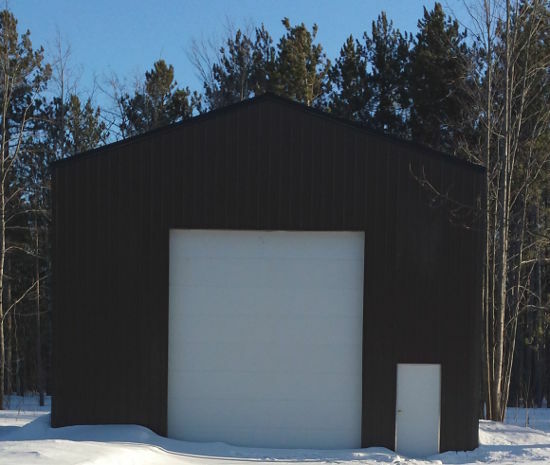 This building is constructed with maintenance free 29 ga steel siding with a 40 year manufacturer paint warranty. Other options include Hardie board, vinyl siding, and wood siding. We provide CHI model 3285 overhead doors for RV garage applications. These doors are insulated, have a steel interior skin and provide rugged durability and excellent craftsmanship goes into each one. A 3285 door is a micro-grooved polystyrene sandwich door constructed with 26 ga exterior skin and 27 ga interior. Section joints are tongue and groove. They are available in white, sandstone, or brown. These doors have an estimated R value of 8.74 and use CFC free polystyrene insulation secured in place with adhesive. We offer online kit pricing for your future RV garage and you can colorize and locate doors and windows while pricing your building. We also publish pole barn prices for standard sizes for general storage and smaller garages. For questions or special need please contact us via email or call (210) 650-2276 Monday-Friday from 8:00 am til 5:00 pm. We are here to help you complete your project successfully from start to finish. I am interested in your buildings. I’m wondering how much it costs. I have a 16ft camper but with the tongue it’s like 21 ft long. I would like more information on this. Thank you.